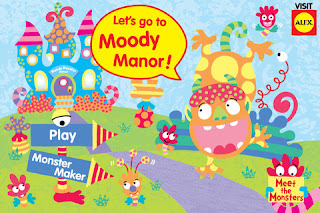 With Hallowe'en fast approaching, I want to tell you about Moody Monster Manor, a cute little app for kids. Calling all kids who love monsters! Come with us to Moody Monster Manor. You can create your own monsters, play fun and exciting games, win monster merit badges, or meet the 20 monsters through the Moody Monster audio tour. Moody Monster Manor is a place to learn about dealing with emotions through engaging and interactive games -- Zap Scared Sam’s bad dreams with your magical monster flashlight or whip up a pot of Stinky Sneaker Stew for Hungry Hank. Help Confused Carl throw a Monsterrific party or show your brainy side by breezing through Worried Wanda’s homework. Whether you’re making the monsters a silly snack, rescuing them from a nightmare or helping them with homework, you’re always taking care of your Moody Monster friends and helping them solve their problems. There is so much to do in Moody Monster Manor! Also, there are locked doors that might be there for more games in a future app upgrade? But there really are lots of nice activities for free, so I will try not to be a Worried Wanda! 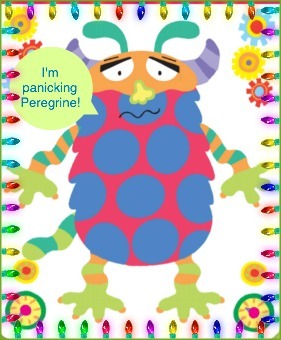 Here's a monster I made with the app, using screen shot and crop, then speech bubble and frames added via Ribbet. Resh, it's lovely art work, isn't it? Wish I could take the credit for my cute monster!